Several months ago I received a brand-new beautiful review copy of Cybele Pascal's latest cookbook, "Allergy-Free and Easy Cooking." And my friends... if you deal with multiple food sensitivities or allergies, this book is DEFINITELY for you. Cybele made EVERY recipe in this book free of: gluten, wheat, dairy, eggs, soy, peanuts, tree nuts, fish, shellfish, and sesame. The book contains 75 recipes for quick and easy 30 minute meals at home. TO be honest, I receive so many cookbooks, I wasn't really sure what to expect with this book. But as soon as I started thumbing through it, I immediately smiled. These are easy, everyday, "down home" comfort foods... and that is the kind of cooking I like to do. I'm about as far from a gourmet as you can get (although I do prefer freshly grated pepper and nutmeg, smoked paprika, and grass-fed beef... I mean you have to have some priorities right? :-) Cybele does an amazing thing here... as a sophisticated wife, mom, entrepreneur, chef, and home cook she takes the gluten-filled foods you loved and remember and turns them into allergen-free masterpieces with basic, healthy ingredients you probably have in your pantry right now. There are a few specialty ingredients you will need for some dishes (such as Daiya dairy-free, soy-free "cheese" -- which I LOVE) but most of these items can easily be found online, if not at your local higher-end grocery store like Whole Foods. I had every intention of trying the Salisbury steak tonight because I have to admit, on the occasional time we had frozen dinners growing up, I LOVED Salisbury Steak... and I was SO excited when I saw Cybele's rendition of this classic ground beef steak and gravy. However I have a very special treat for you my dear readers... Yep! You now have a chance to win a copy of this wonderful book. Many cookbooks will come and go, but I truly think Cybele's "Allergy-Free and Easy Cooking" will be on your kitchen shelf for years to come! THIS GIVEAWAY IS NOW OVER!! Congrats to comment #17 Lisa D! I hope you really enjoy the book! 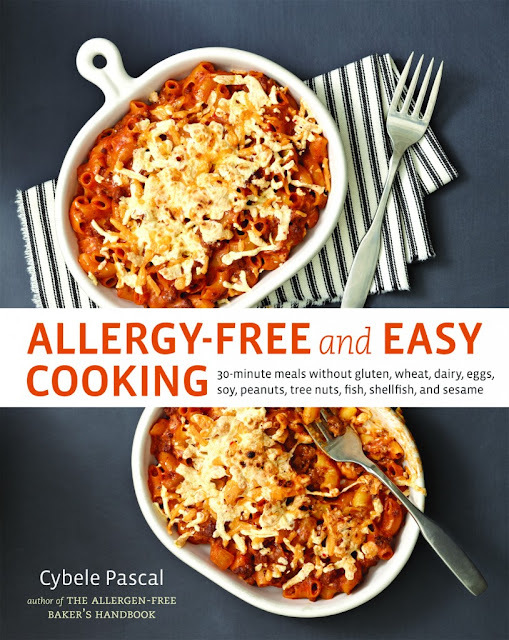 I am giving away one brand new copy of Allergy-Free and Easy Cooking by Cybele Pascal. This giveaway is limited to residents of the 48 contiguous United States aged 18 and older. The giveaway begins January 8, 2013 and ends on January 15, 2013 at 11:00 pm eastern time. Ten Speed Press provided me with a free copy of "Allergy-Free and Easy Cooking" for the purpose of sharing an online review, if I chose to do so -- ALONG with 1 brand new copy to giveaway. This is not a sponsored post and I did not receive compensation. The opinions in this post are completely my own. I would love to win the "Allergy-Free and Easy Cooking." by Cybele Pascal. My daughter is at college and has multiple food allergies. This would make a great gift to her for menu planning and healthy eating! I am a huge fan of Cybele's recipes and use her previous cookbooks all the time to prepare meals and treats for my family. My boys have different food allergies and I would LOVE to win Cybele's newest book to continue cooking wonderful recipes for my family. What an awesome giveaway! Oooh I'd love to have that book. It's so hard to come up with foods my whole family will eat. Kids are gfcf and husband is not. So its hard to please everyone but Cybele's recipes are always awesome! I've fed her chocolate maple cake to 1st graders who had no idea they were eating gluten free! I would love to win this - my oldest dauther (5) has all top 8 allergens :/ diane.mallare at gmail dot com! Hmm. This is something I will have to check into. Not only being gluten free, but because it's for quick and easy recipes. While I like cooking, most days I just don't have all that much time. To win a copy of the "Allergy-Free and Easy Cooking" book by Cybele Pascal would truly be a blessing for our family. After an exhausting search for a diagnosis, my husband finally found out six months ago that he has gluten and soy allergies, on top of already being lactose intolerant. I had to throw my whole cooking repertoire out the window and am still struggling to find ways to make delicious, healthy, and safe meals for my family. To compound matters, I too believe I am dealing with a mystery food allergy now and I suspect the culprit may be eggs..... :( Help! Thank you so much for your blog, your cookbooks, and dedicating so much of your time to help others! My email address is: sarahclf@aol.com. I would be SO blessed by this. I am gluten free & have lactose issues. I have 2 daughters that are lactose intolerant too. Never won a cookbook before - but this one would be ideal - my husband has bben gluten free for almost a year and now the doc wants hime to go milk free, trying to make and find milk free recipes is harder than I thought - this book would be greatly appreciated and quite helpful. I would love to win this because I have Cybele's previous book and love it! This looks like a wonderful cookbook and would love to add it to my collection! 3 months ago I found out that I'm allergic to milk, wheat, eggs, gluten and peanuts...at the age of 29! What a life change! I would be thrilled if I were chosen to receive this cookbook as I'm looking for new ideas. My email is susanrenea@cableone.net. Thanks for offering this! My email is devotedlittlewomen[at]yahoo[dot]com. I would love to win a copy of this book. Easy comfort food is right up my alley.!!! Thanks for the review & the giveaway. I am one of those people whom it is easier to tell you want I can eat than what I"m not allowed to eat. This book would be a great help to widen my diet. I own Cybele's baking book and every recipe is a winner! This one looks just as promising. I've been struggling with food for almost 3 years now. My issues have made it impossible to have a family meal. This book sounds like a wonderful place to start! Thank you for the contest! While I certainly hope to win, I wish everyone the best of luck! This cookbook looks amazing! My three year old has multiple food allergies, and I only cook dinners for the family that he can eat, so I would love to expand the variety of food that I make right now! Hopefully Google should show you my e-mail address or I'm part of your yahoo group as Tegeb and my address is listed there. After seeing a friend show how much information you can find out about someone using just their e-mail, I'm cautious about posting my address in public. Would love to have this cook book. I get as many recipes off the internet that I can for my husband and myself, but would love to have a "real" gluten-free cook book to cook from. Thank you for contributing to raising the awareness of this healthy way of eating and living. Congratulations. Please enter me in your drqwing. What a wonderful book to offer to someone. Thank you for being so kind. Should I win you can reach me at. I would love to be entered in your drawing. Thanks! This cookbook sounds fantastic! Thank you. A recommendation from you is reason enough to sign up to receive a chance at winning. Whether I am the winner or not, it looks like this will be on my shelf one way or another! I have celiac sprue and now other autoimmune diseases, as does some members of my family. I am a VET with a disability taking care of my two teenage grandchildren and ill daughter who is pregnant on not much money. I have to start doing gluten free and lactose free, as I am getting much worse. Since I am constantly trying to cook around allergies --- this cookbook would be great. I really appreciate the opportunity to be in the drawing for the "Allergy-Free and Easy Cooking" cookbook by Cybele Pascal. Since my daughter found out she was gluten intolerant the whole family has switched most of the foods we prepare to gluten free. I would LOVE to win Cybele's new cookbook! Knowing how much I still love my Baker's Handbook from her collection, I believe you that this one's another hit!! I would love to win Cybele's new book. She was the first allergy free cookbook author I found when we began our allergy journey. So excited to try this new cookbook! You can never have enough allergy-free recipes!! This would be a great way to enjoy cooking and eating dinners while I'm on the top-8 allergy diet to help my 3-mo old son. I can be reached at dremilyjackson (at) gmail (dot) com. Thanks for all you do with educating us and sharing your recipes and expertise with all of us that have to be on special diets. I would love to win his cookbook for new recipes to try. I can be contacted at dwilliy@socket.net. Would love this Cookbook, could always use more meal ideas! You can reach me at ryoder8@cox.net. Sounds like an awesome book, would love to win and explore these recipes. Sounds great! We have multiple allergies/sensitivities in our gang. I would love the opportunity to own this cookbook:) Ty for offering the chance to win! I would love this cookbook to help with all our allergies. I would love to win this. We have multiple food allergies in our family and meals are always a struggle!